Welcome to our Bank of America – Oak Cliff Location. 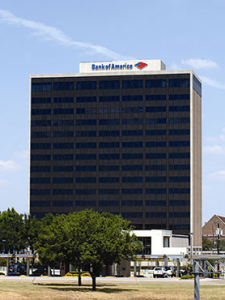 The Bank of America-Oak Cliff Tower is located on the corner of Zang Blvd. and 12th Street. The office is located on the 8th floor, Suite 804. To get to the office from the north, you would come down I-35 South, towards Waco, and take the Beckley/12th Street exit. From the south, you would take I-35 and exit Zang/Beckley exit. This leads directly to the building.